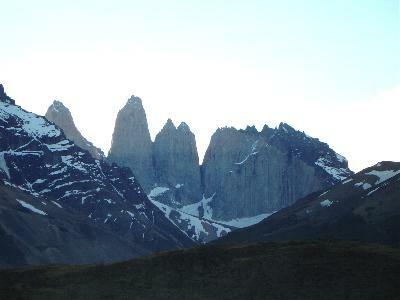 This is one of the main reasons why I came to Patagonia in the first place : to see the famous mountain peaks of the Torres del Paine National Park in Chile. How many times I hadn't seen these in pictures, and yet now that I was standing here it was feeling greater than reality. I often felt like being in a dream, in a perfect natural environment, where everything is beautiful and peaceful, but also so different that it became a little strange - only the pain in the feet after a days walking brought me back to reality but at night when sleeping in my tent, the dreams came back and the sounds of the horses galloping next to the tent in the morning didn't break the dreams but only amplified them. 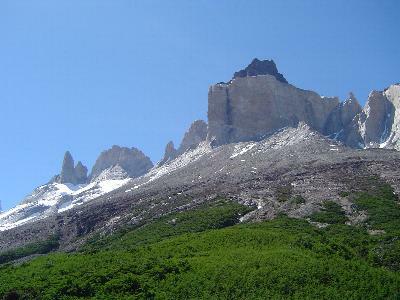 We arrived with the catamaran, after a fantastic boat trip with views of 'Los Cuernos' and 'Paine Grande' and many more beautiful mountain scenery. The weather was great - sun and blue sky - not the Patagonia we expected, and we quite couldn't believe it was going to stay like this. The campsite next to the lake and with great views all around, this was the start of the dreams and surreal experiences. Day 1 - After a 2 hours walk along the Grey river, a glacier river with many floating icebergs and which really looks grey (but all glacier rivers do), we reached the lookout point for the Grey glacier. The last part was quite rocky and windy, the experience of sitting on top of a rock and admiring the great glacier, was truly surreal experience number 1. Along the way while we walked, we could drink from the stream of mountain water, pure and ice cold and tasty. The firebush were blooming, the green was fresh - spring at its best. We enjoyed camplife and a good sleep in our tent - it felt just all great to be there..
Day 2 - some 20 kilometers or more of walking along the French valley today. 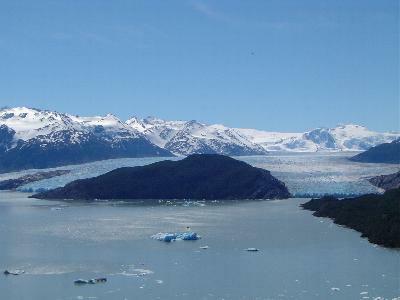 After a couple of hours, and many pictures later, we reached the first lookout point - great views of the cuernos and Paine Grande, the highest mountain of the park and always covered with snow and glaciers. I sat for a couple of hours there and saw maybe 10 snow avalanches - even filmed one that lasted maybe 5 minutes on my mpeg photo camera - surreal experience number 2 ! The way back was long and tiring, after every bend I hoped to see our tents, but this idea just made it longer... Finally when we arrived, we took the catamaran to our next camping site. This camping site was on private ground, more remote, and our driver even spotted a puma at night - I only heard the horses galloping next to the tents in the morning. Day 3 - Another full day of hiking, this time to the refugeo Chileno and to the base of the Torres ! The highlight of the trip for many, and the first view of the torres, it is surreal experience number 3. We hiked the first hour all the way up, then on a plateau which leads to the mountain hut 'refugeo Chileno', a place next to a river and with great view on the 'condors nest', the south and the central torre. To see the north tower too, one has to hike some more hours, the last part climbing over big rocks. I was out of energy that day and relaxed at refugeo Chileno for about 2 hours, enjoying the views, the sounds, the smells, the good life in the mountains. On the way down we stopped a lot to study the mountain flowers and birds - such a harsh environment and yet such a diverse nature ! The weather stayed great for 3 full days - our guide had never experienced this over here, but we were lucky to be able to enjoy it - another dream that came true.